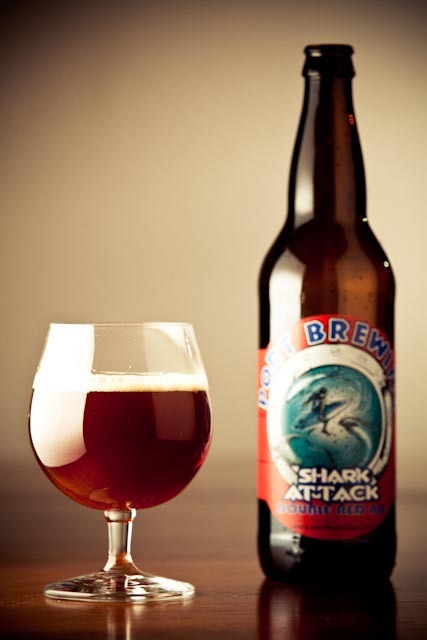 Shark Attack Double Red Ale is an American Amber/Red Ale from California’s Port Brewing. It pours a dark red color (as you should expect) with a thick creamy head. It has a rich caramel malt scent with traces of citrus, pine, resin, dark chocolate, raisin, and toffee. The taste is mostly hops with citrus, pine, florals, caramel, raisin, and dark dried fruits. It’s pretty well balanced with a lot of flavor and tons of carbonation. It’s bold, smooth, and drinkable. It has a hefty 9.0% ABV so you should be slightly cautious when drinking it. A very delicious, flavorful, and exciting beer that I can’t wait to try again.